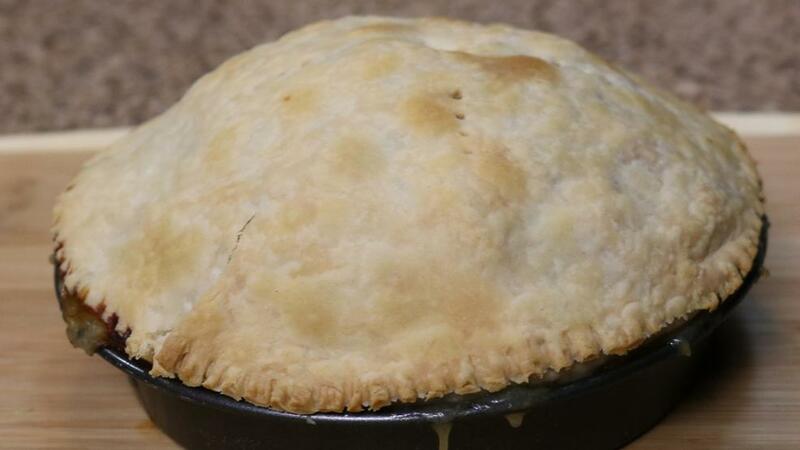 This pot pie is a comfort-food classic and favorite in my Canna kitchen. Enjoy! Measure ½ cup of the chicken stock and set aside. Cut the russet potato into quarters and boil in water, reduce heat to medium and cook until potato is soft. Drain water. In a mixing bowl, add ¼ tablespoon butter and 2-3 tablespoons of milk to the russet quarters and whip. Cut baby potatoes in half. In a small frying pan, add 1 tablespoon of cooking oil, baby potatoes, a dash of salt and pepper to taste, and ¼ cup of the chicken stock. Cook on medium heat for 10 minutes, covered, then uncover and cook an additional 5 minutes to brown. Pour the remaining chicken stock into a medium sauce pan. Add 1 cup sliced carrots or 1 cup baby carrots and 3 celery stocks sliced into bite-size pieces. Bring to a boil and reduce the heat to medium. Cook until carrots are soft, about 7-9 minutes. Strain the remaining stock into a bowl for gravy. Cut ½ pound of chicken into bite-size cubes. In a saucepan, add 1 tablespoon of cooking oil, dash of salt and pepper, and ¼ cup of chicken stock. Heat on medium-high heat, then cover and reduce heat to medium for 7-10 minutes or until chicken is cooked through and tender. In small sauce pan, add 1 cup of the remaining chicken stock and 1 ounce of poultry gravy mix. Add 1 to 2 tablespoons of canna butter depending on your tolerance. Stir, and bring gravy to a light boil, then pull pan from heat and cool. Line bottom of 9-inch pie pan with the pie dough. Add an even layer of mashed potatoes, then add baby potatoes, chicken cubes, carrots, celery and fresh peas. Pour chicken gravy over the pie filling and cover with the top pie dough. Seal the sides with fingers or a fork, and slice the top of the pie crust to allow it to breathe as it bakes. Bake for 25 minutes at 425 degrees or until the crust is a golden brown. Following are my directions for making canna butter with a Magical Butter machine. Prepare canna butter in advance and store for use in all your future recipes. 2-5 cups unsalted, softened butter (Kerrygold pure Irish butter preferred) Important: Minimum is 2 cups/475 ml. Maximum capacity 5 cups/1180 ml. Do not use margarine or water. 1 tablespoon lecithin per cup of butter. Place the ingredients into your Magical Butter machine, and secure the head. Press the temperature button and select 160°F/71°C. Then press the 2 Hours/Butter button. After the cycle is complete, unplug the unit and remove the head of the appliance. Put on the glove that’s provided with the appliance, and pour the contents slowly through the supplied filter into Magical Butter trays, formed molds, or other storage container. Note: For best results do not pre-grind botanicals. Adjust botanical weight according to personal preference. Magical Butter machines can be purchased online from numerous retailers for about $150, and a quick Google search will turn up many reviews and videos that explain how to use the machine to make canna butter, infused oils, soups and other foods using cannabis, as well as other medicinal and culinary herbs. Other companies make similar appliances, but you don’t have to use a machine to make canna butter. You can find directions online for making cannabis butter using a double boiler or other utensils you may already have in your kitchen. Reach freelance writer Jinny Neiswanger at herbandspicecannabisisnice@yahoo.com.